Master Sommelier is more than just a title; it’s a badge of honor, and to earn it you need to be a wine expert in mind, body, and spirit – an achievement measured by passing one of the world’s most difficult exams. For those who pass, admittance is gained into a club with fewer than 200 members in the United States and access is granted to the most desirable jobs in the entire food and wine industry. A six-episode TV series named “Uncorked” follows six aspiring Master Sommeliers from New York, as they prepare for the Court of Master Sommeliers’ highest level exam. 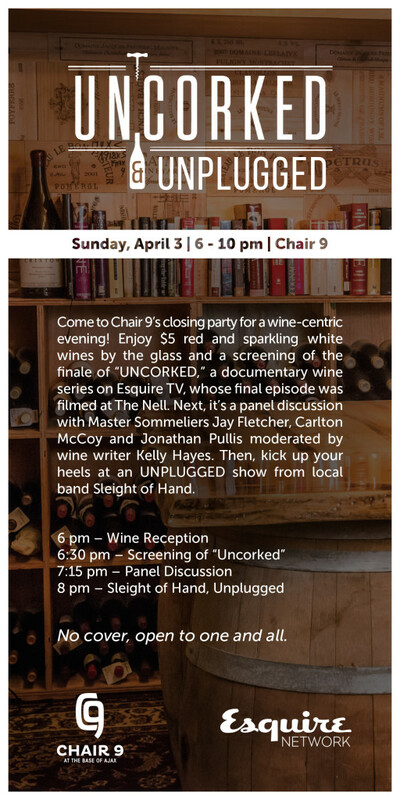 The show aired on Esquire TV in the fall of 2015, with the grand finale filmed at The Little Nell where the Master Sommelier exam takes place annually. Enjoy $5 red and sparkling white wines by the glass from Southern Wine & Spirits and one last night to order off of the Chair 9 menu for the season. Next, it’s a panel discussion with Master Sommeliers Jay Fletcher, Carlton McCoy and Jonathan Pullis, moderated by wine writer Kelly Hayes. Then, kick up your heels at an UNPLUGGED show from local band Sleight of Hand. No cover – come one, come all.